The Walnut Street Bridge is a single-span, pin-connected, steel, Pratt through truss. Designed in 1904 by the W.S. 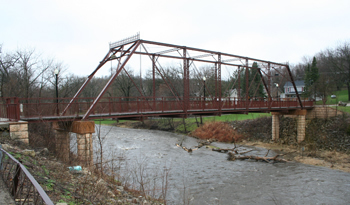 Hewitt Company to carry Walnut Street over the north branch Zumbro River in the city of Mazeppa, it has since been converted to pedestrian use. The Walnut Street Bridge is significant as an example of the work of William S. Hewett and the W.S. Hewett Company, an important Minnesota engineer and bridge building firm. It is also significant for its high artistic value, as expressed in its exceptional ornamentation. In 2001-2002 the City of Mazeppa rehabilitated Bridge R0412. A non-historic wooden pedestrian walkway and rail were removed, longitudinal stringers and deteriorated steel truss members replaced, and truss bearings rehabilitated. The original limestone masonry abutments were replaced with concrete abutments. The deteriorated iron cresting atop the bridge portal was replaced with sheet steel cresting patterned on the original. A new metal rail, timber deck, and light standards were installed. In 2002 the bridge re-opened to pedestrian traffic; that same year, the project received the Minnesota Preservation Award from the Preservation Alliance of Minnesota. Minnesota builder William Hewett and firm W.S. Hewett Co.
careful attention to original detail.